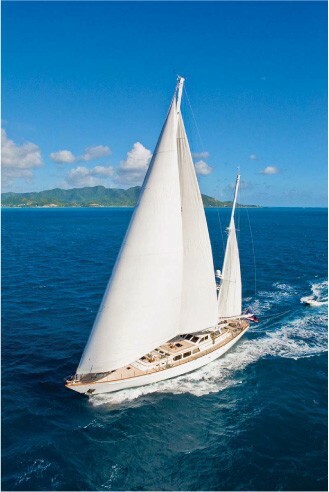 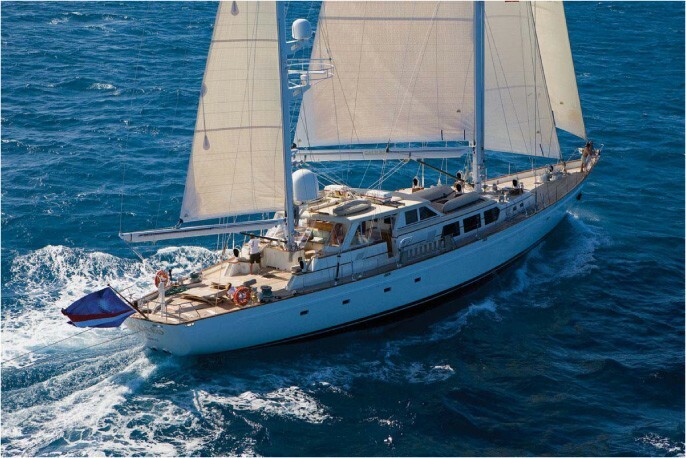 Sailing yacht GALILEO G is a 37,50m (123’) luxury ketch motor sailor designed for world cruising by Sparkman & Stephens built at Palmer Johnson Yachts in 1989. 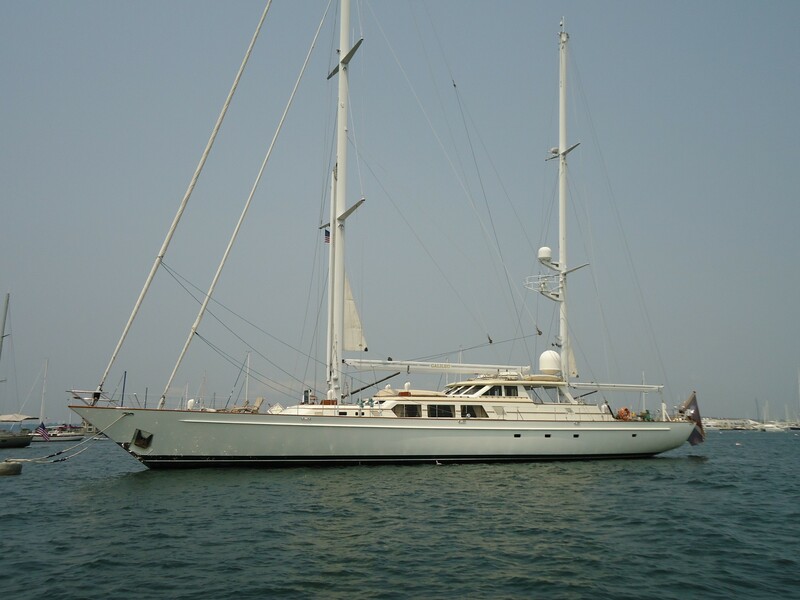 The yacht is maintained in mint condition and received a refit in 2008. 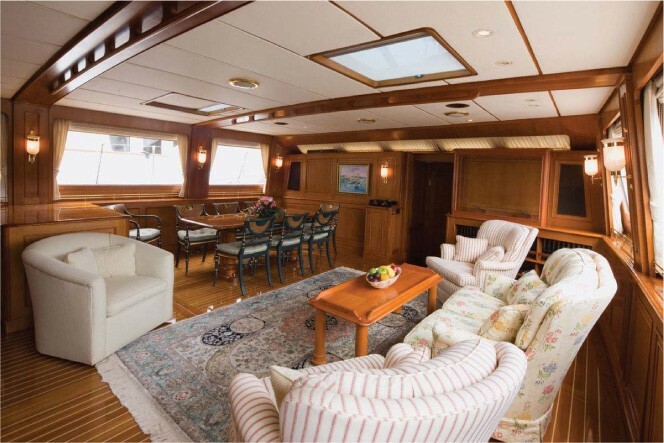 Sailing yacht GALILEO G has a classic interior designed by John Munford. 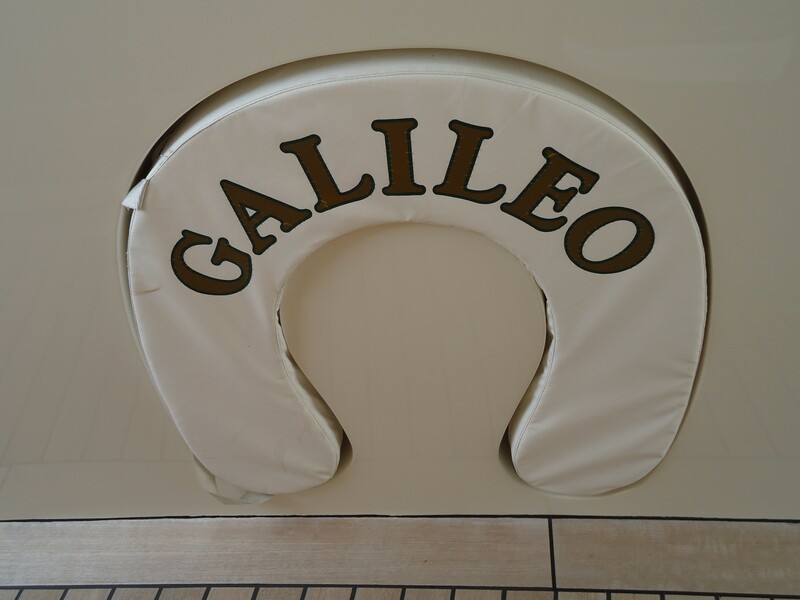 All GALILEO G’s interior soft furnishings and artwork were recently updated in 2008 and have stayed in keeping with GALILEO’s traditional classic style. 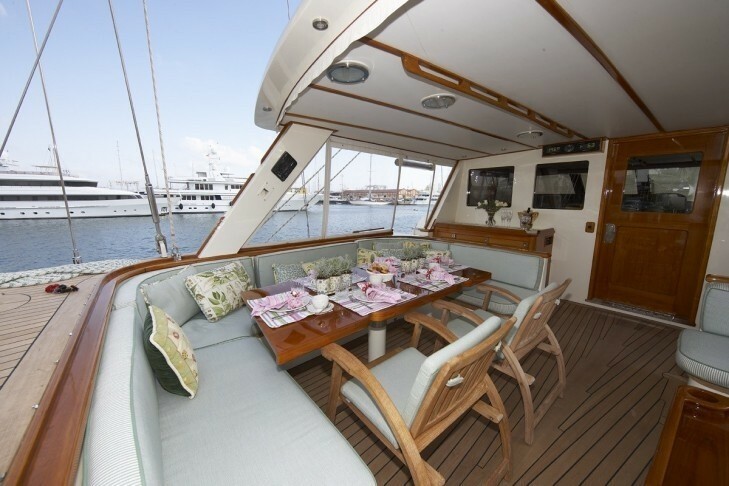 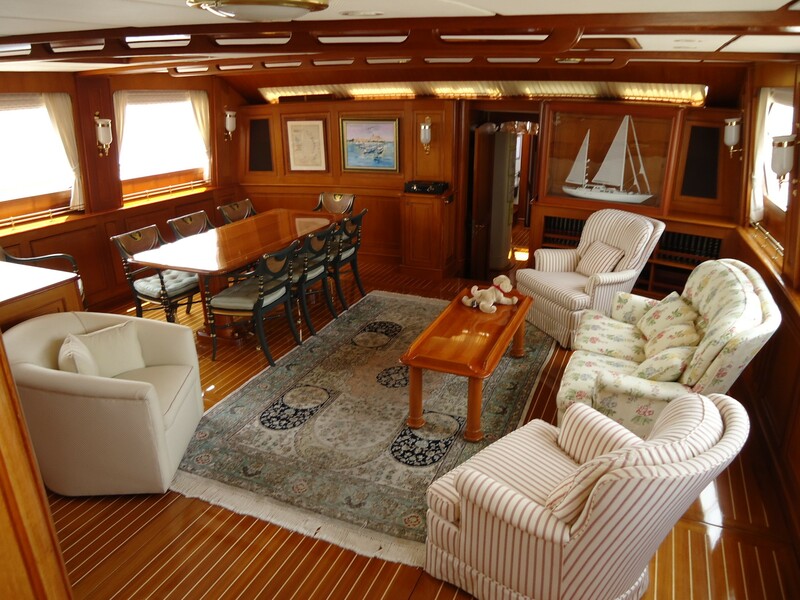 Charter yacht GALILEO G features a welcoming salon with comfortable couches and a formal dining table for 8 guests. 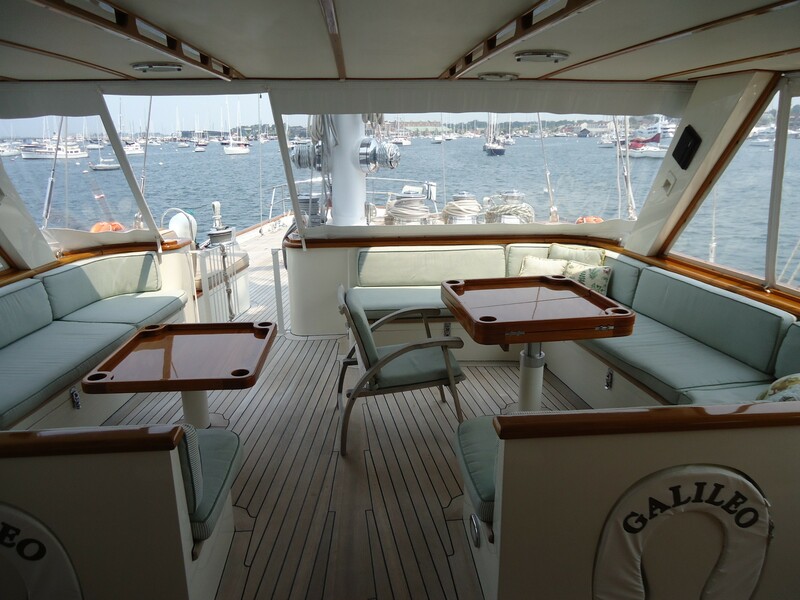 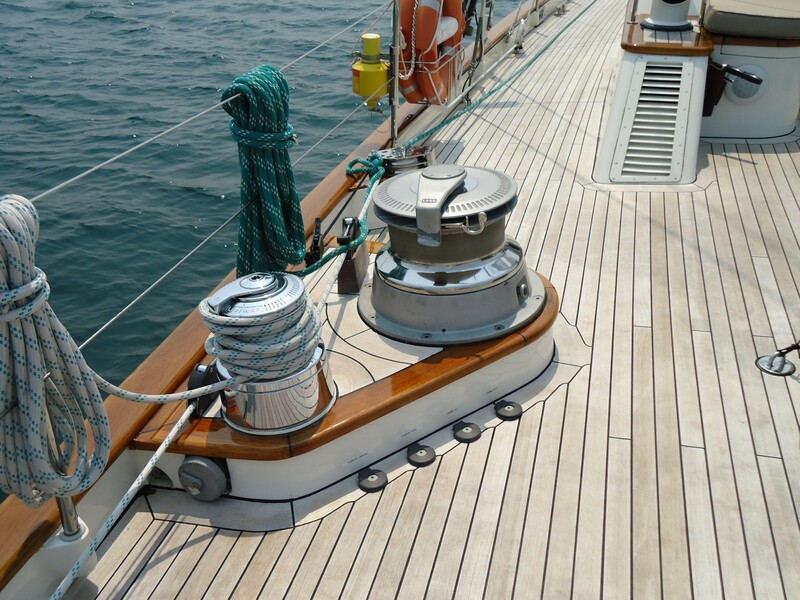 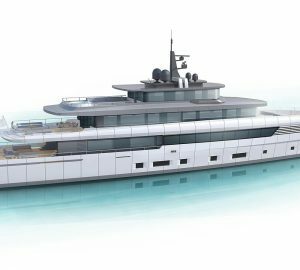 GALILEO G’s classic interior is finished in quarter-sawn golden teak panelled bulkheads and attractive teak and holly flooring. 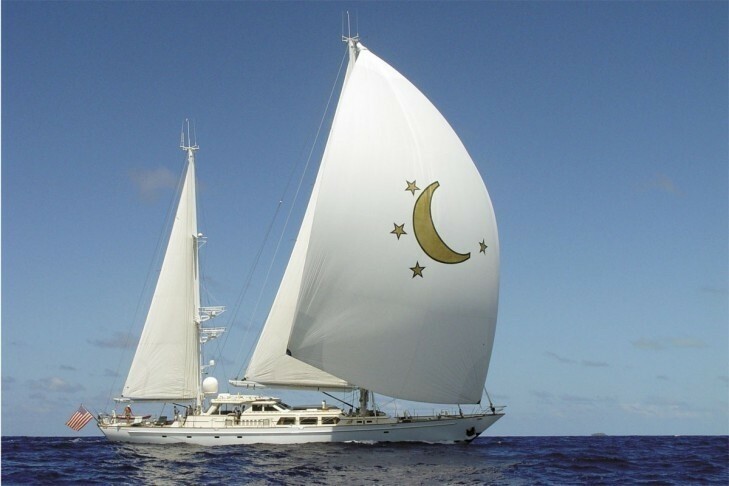 Luxury sailing yacht GALILEO G offers accommodation for 6 guests (or a family of 7) in 3 superbly finished guest cabins located aft of the salon. GALILEO G’s twin cabin is located to Port and features twin berths either side of a custom hand-crafted teak chest of drawers. 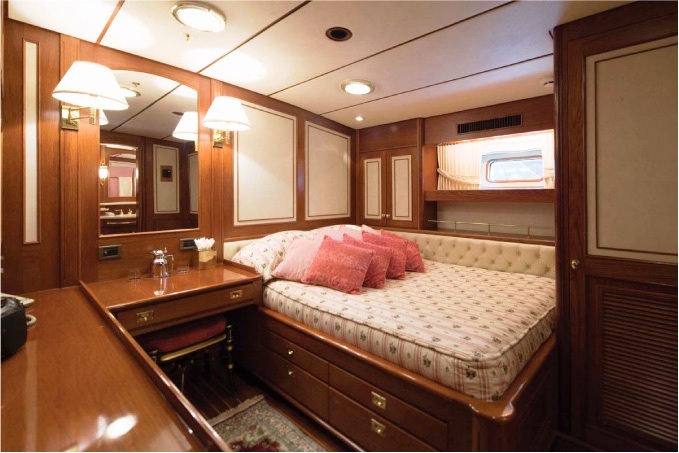 The twin beds are surrounded by upholstered head and sideboard, with large storage drawers beneath. 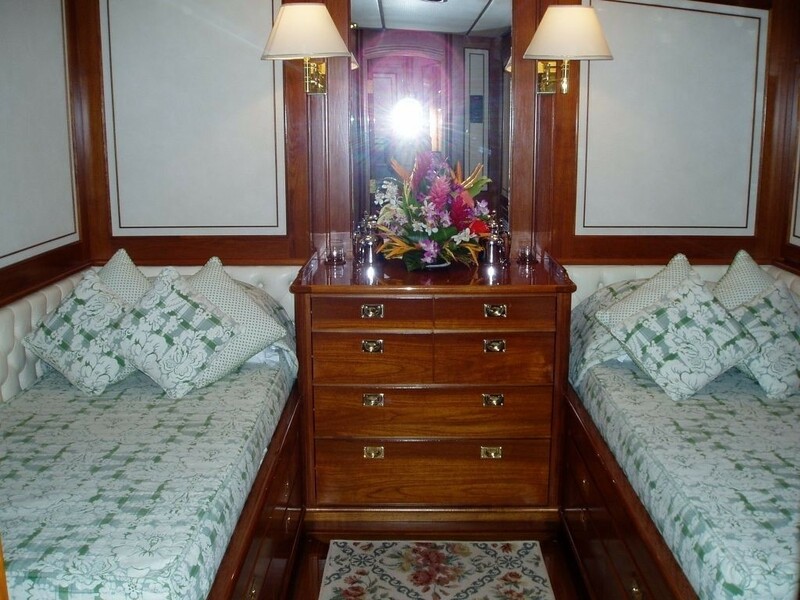 There is a television / entertainment system in this cabin also. 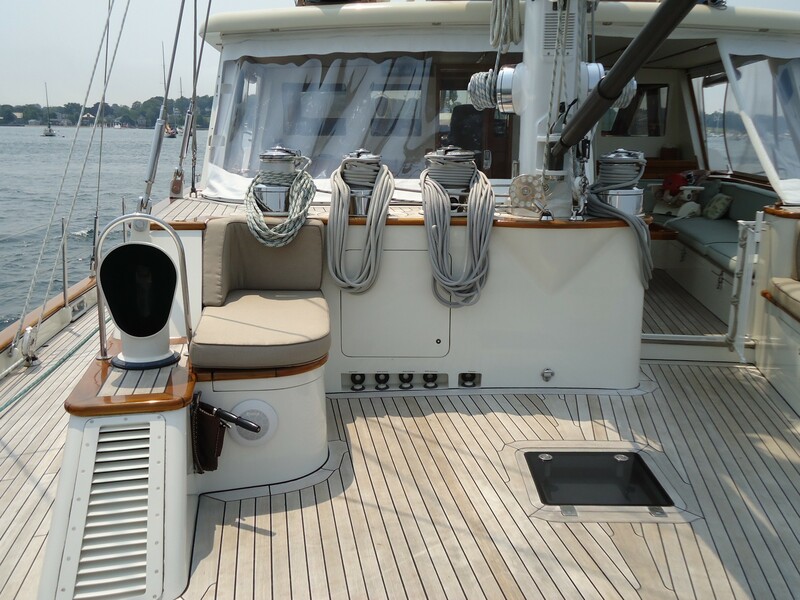 An en suite guest bath offers a large shower stall, Corian countertop and sink, ample storage and beautiful teak detailing. 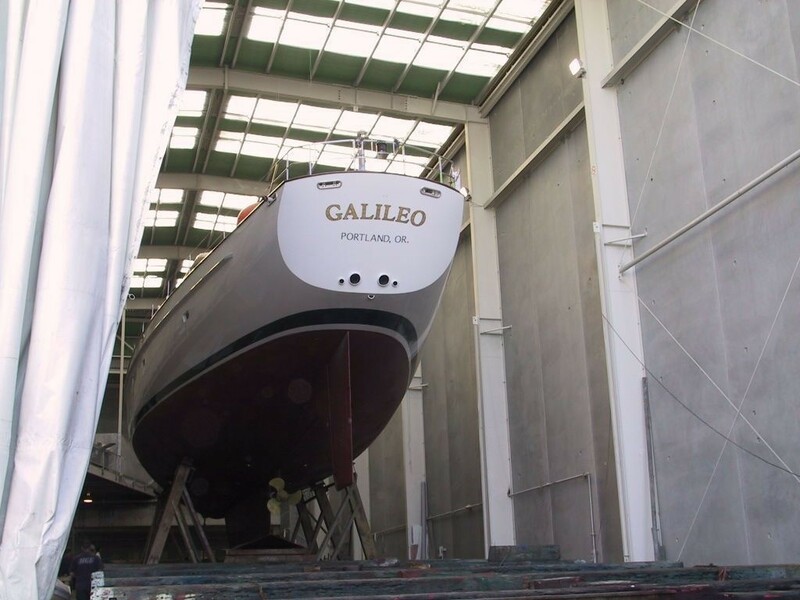 GALILEO G’s Crew of 6 are accommodated separately. Luxury sailing yacht GALILEO G offers great deck space forward and aft along with a large, protected cockpit featuring a comfortable alfresco dining table where you can shelter from the elements while enjoying the panorama. 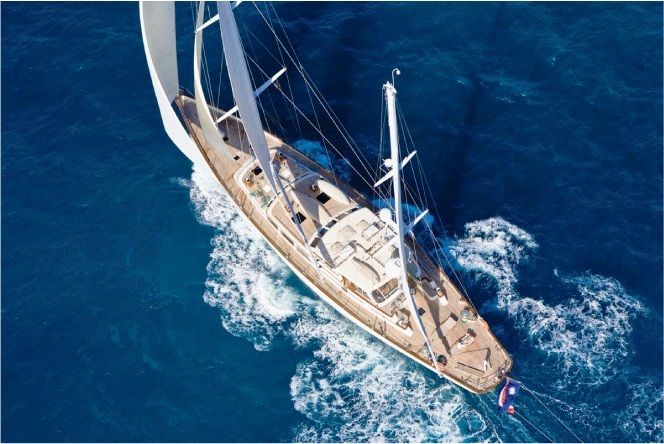 Luxury sailing yacht GALILEO G offers accommodation for 6 guests (or a family of 7) in 3 superbly finished guest cabins located aft of the salon. 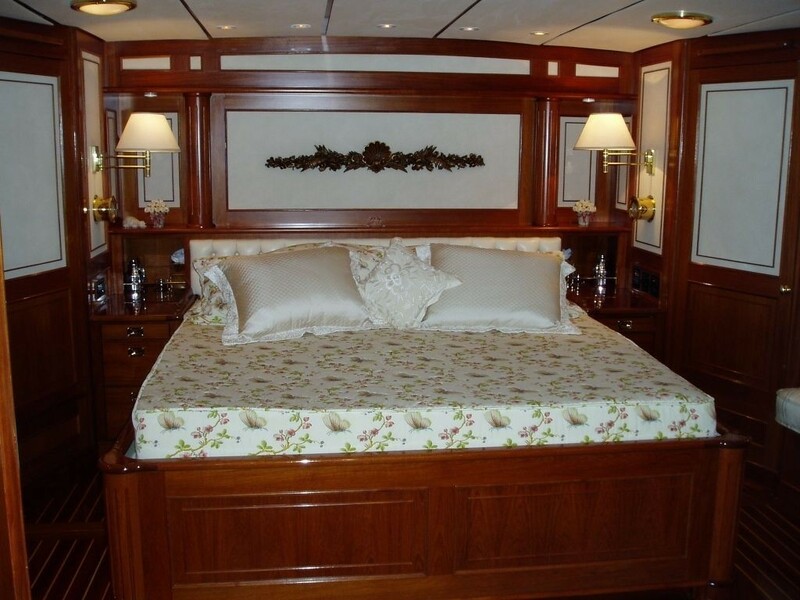 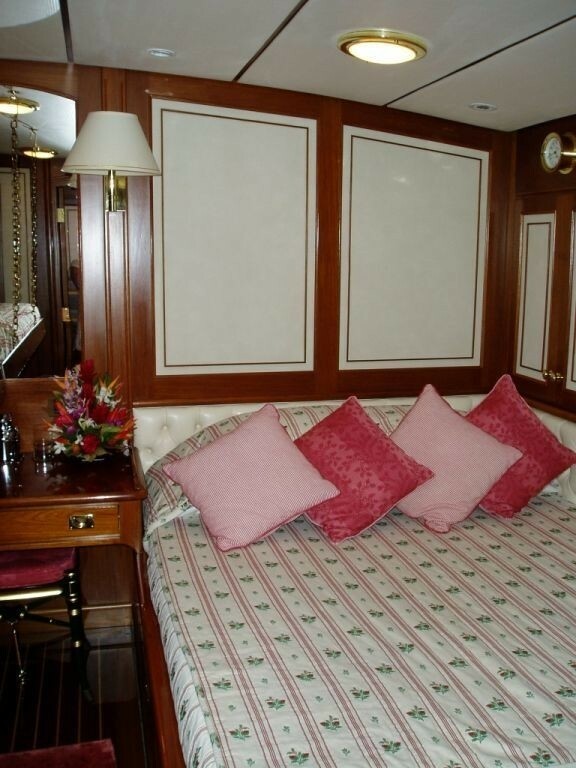 Her full-width Master Stateroom is located aft and has a walk-around king size bed, with rounded corners and beautiful teak detailing plus large storage drawers below the bed. 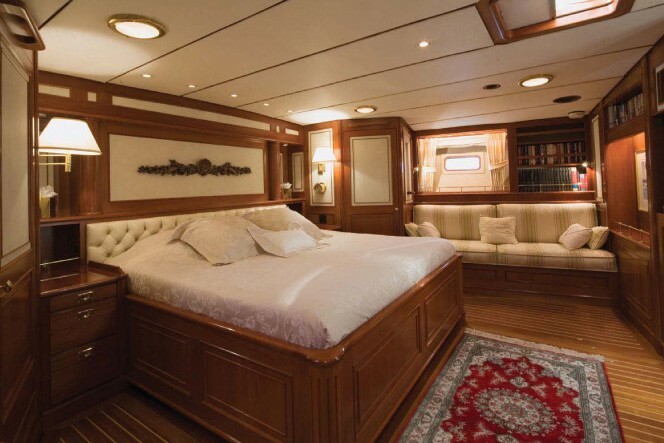 Beside the bed are matching bedside tables, brass lamps and easily accessible lighting controls. 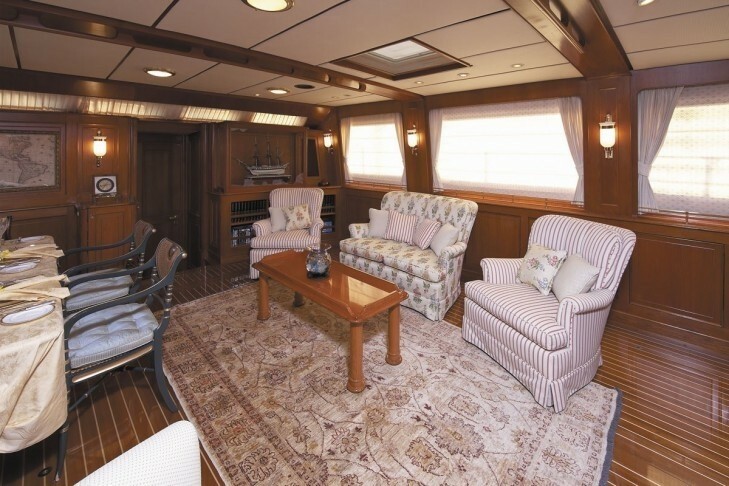 The cabin also features a state of the art television and entertainment system. 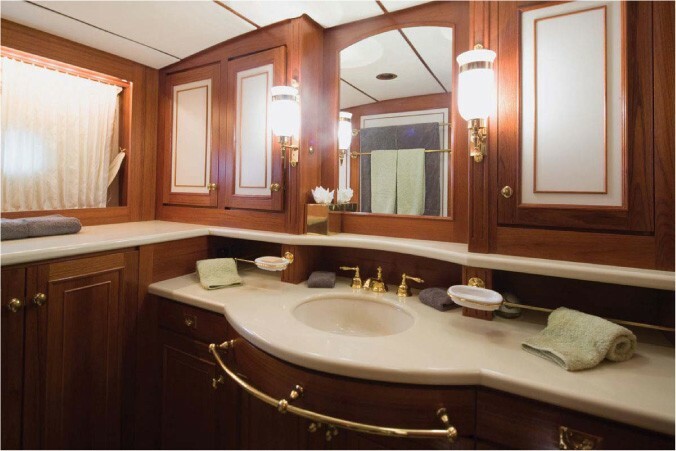 To the starboard of the cabin is the spacious master bath with tile and contrasting elegant Corian countertop and sink .The ensuite boasts ample storage and beautiful teak detailing throughout as well as a fully enclosed shower and a full sized bathtub. 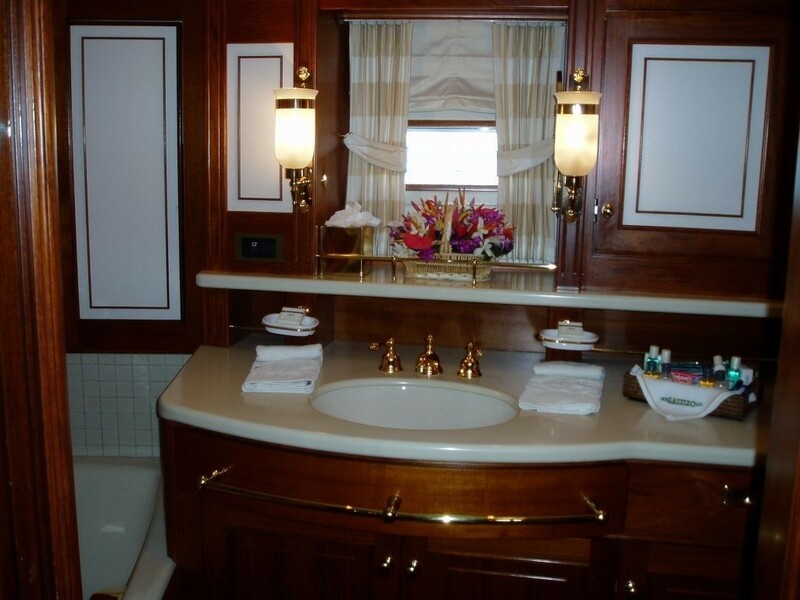 Aft of the bath there is a vanity / writing table below a port light to provide natural light. 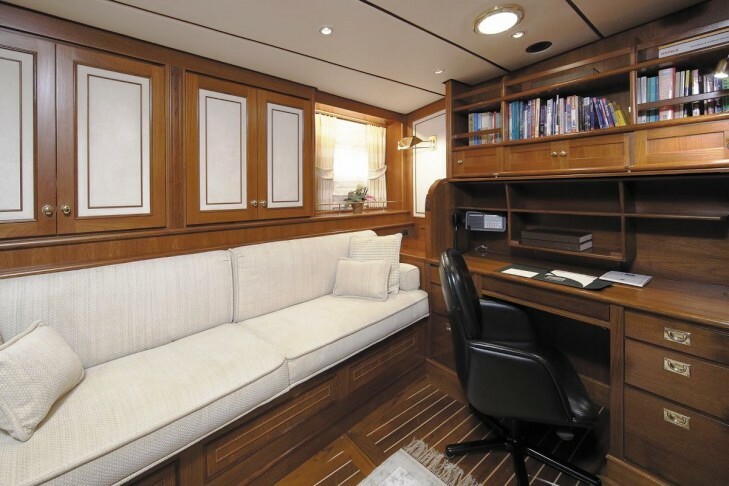 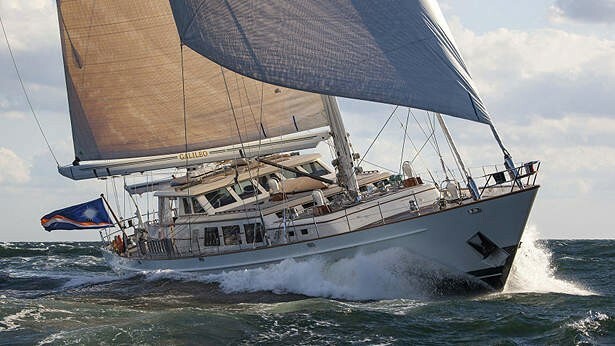 Palmer Johnson Sailing yacht GALILEO G’s double guest cabin is located to Starboard and features a double bed with upholstered head and sideboard, a custom teak desk, and a Pullman berth that opens to accommodate an additional guest if required. 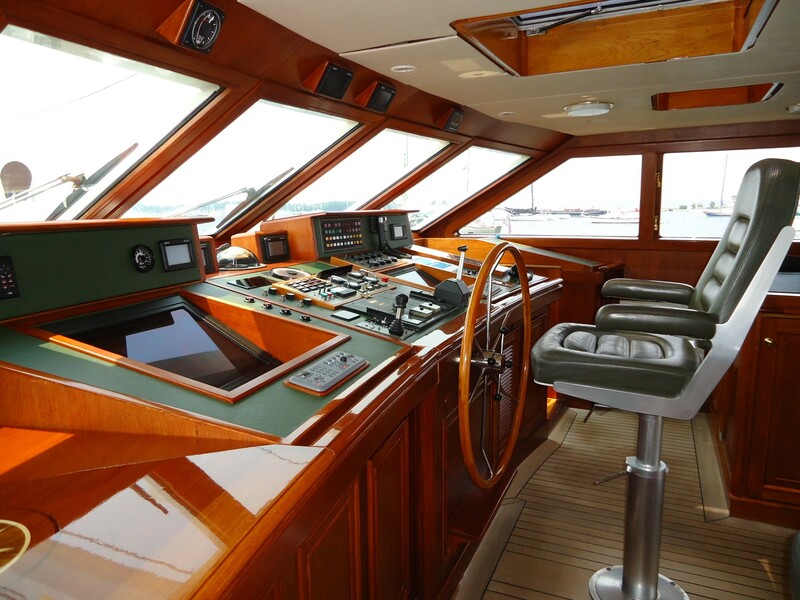 There is also a television / entertainment system. 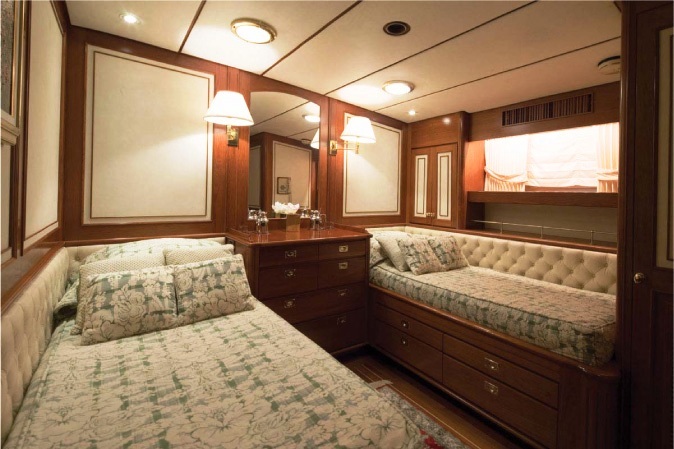 The guest cabins en suite has a full shower stall, Corian countertop and sink, plus ample storage and beautiful teak detailing. 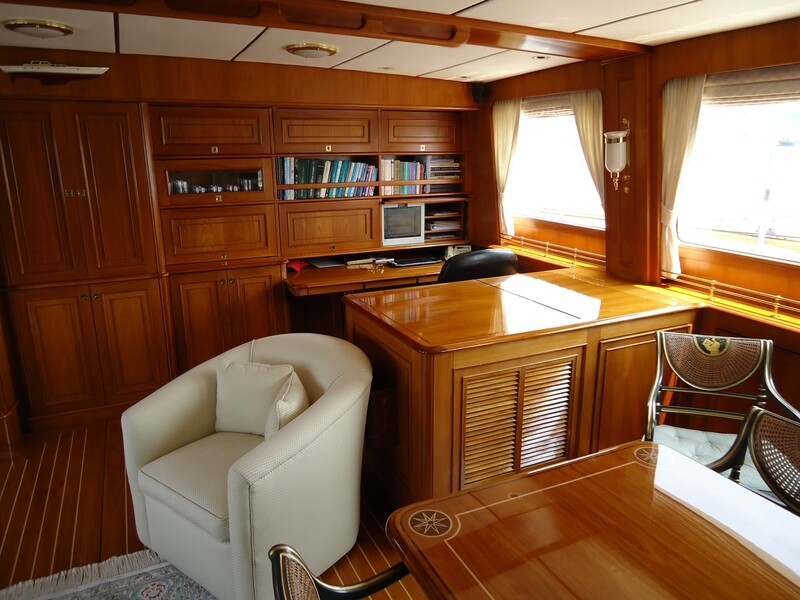 GALILEO G’s twin cabin is located to Port and features twin berths either side of a custom hand-crafted teak chest of drawers. 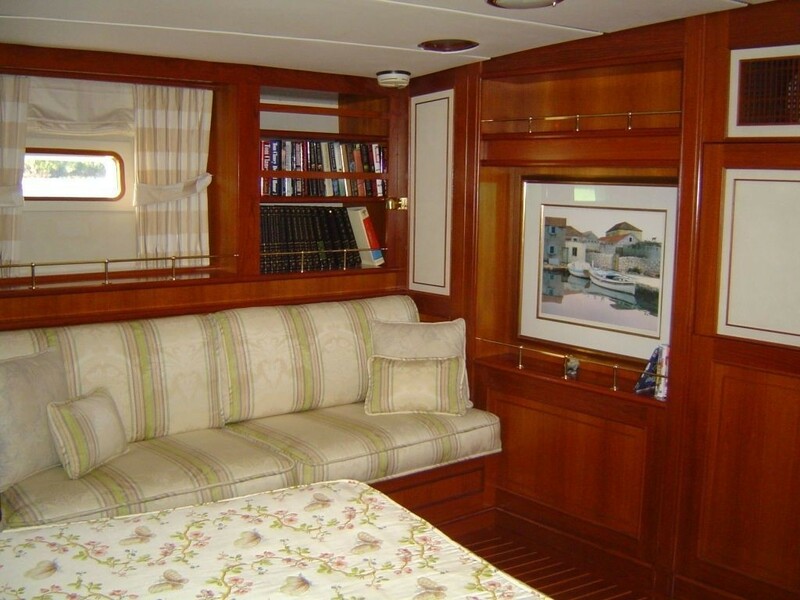 The twin beds are surrounded by upholstered head and sideboard, with large storage drawers beneath. 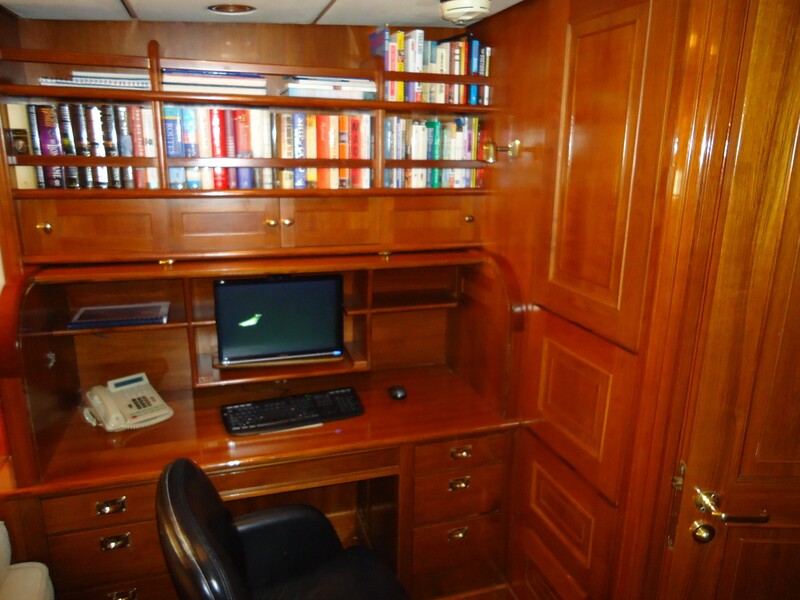 There is a television / entertainment system in this cabin also. 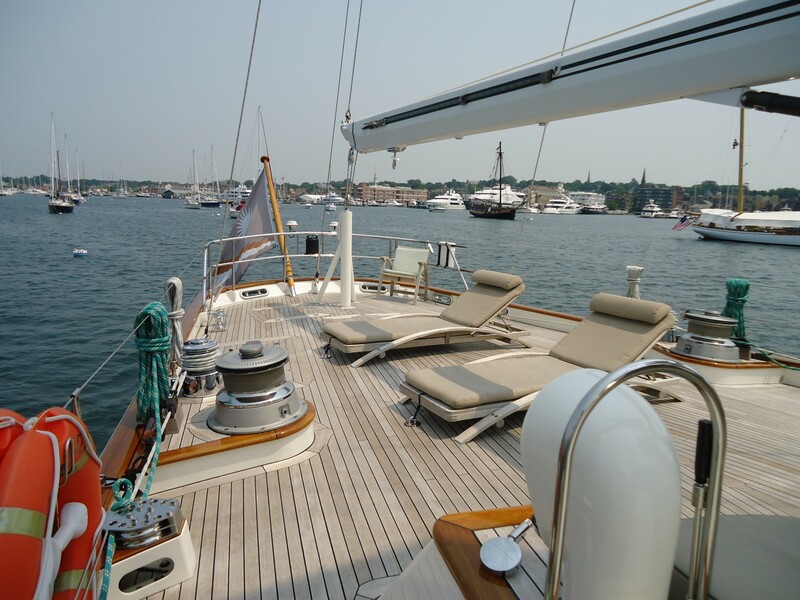 An en suite guest bath offers a large shower stall, Corian countertop and sink, ample storage and beautiful teak detailing. 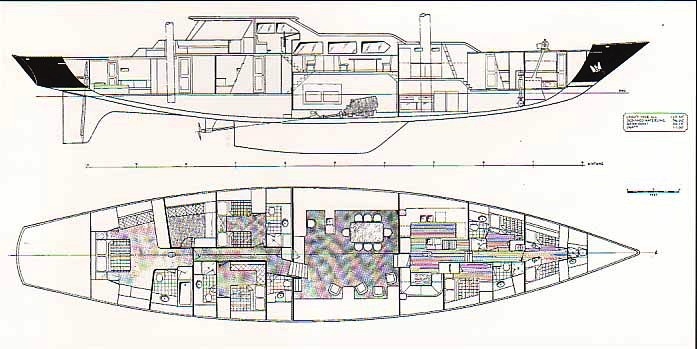 GALILEO G’s Crew of 6 are accommodated separately. 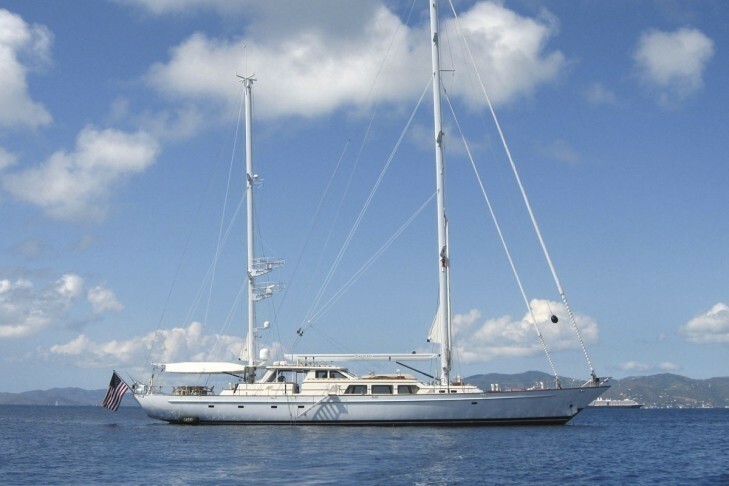 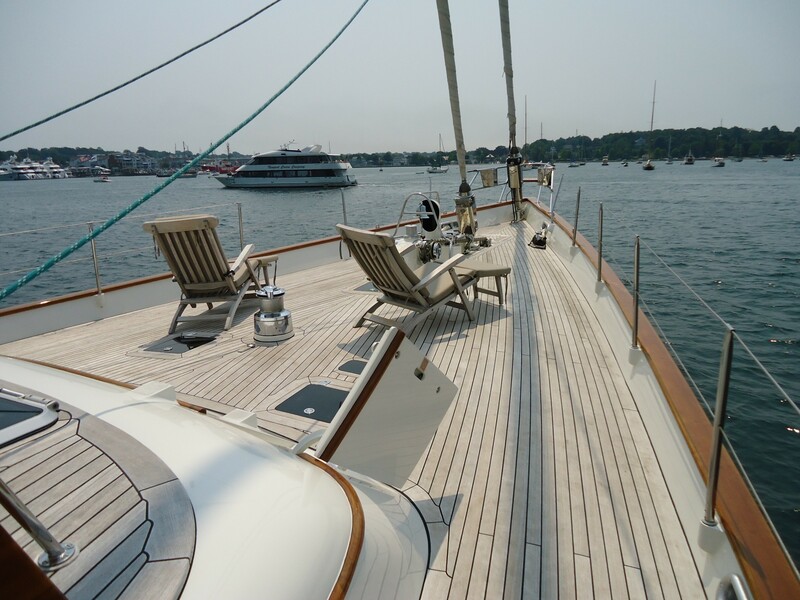 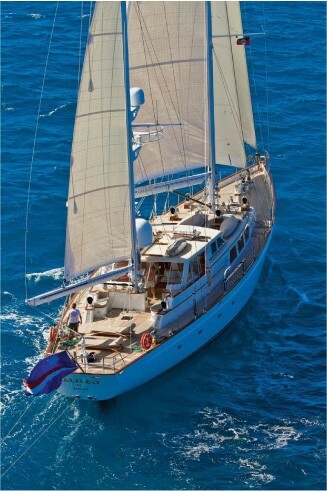 Please contact CharterWorld for a full list of extras onboard sailing yacht GALILEO G.